(Please click for a full size zoom version of the letter). Until the 10th Shamarpa, the omniscient Shamarpas have been great masters respected throughout Tibet and were wise, compassionate, and powerful masters known as the “Victorious Lord of Dance” who were the life force of the Karma Kamtsang teachings. 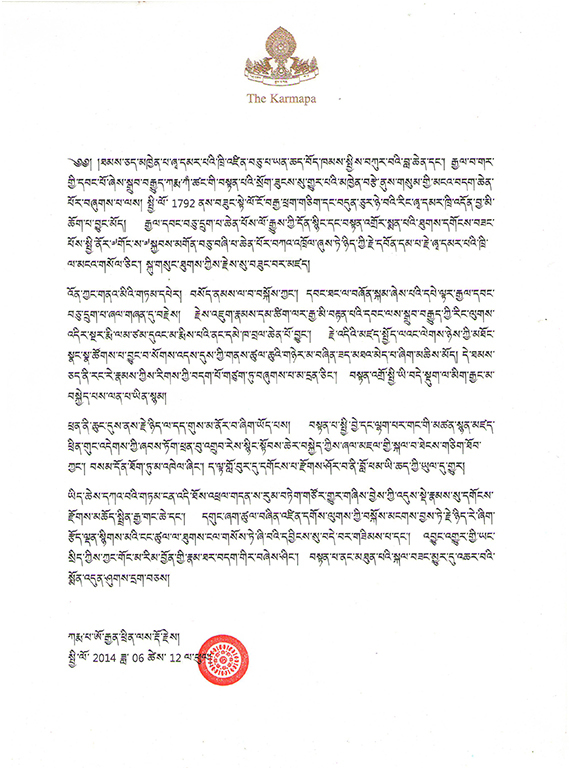 Despite a ban on the Shamarpas’ enthronement since 1792 for almost a hundred and seventy years, His Holiness the 16th Gyalwang Karmapa, in view of historical significance and for the benefit of Buddhadharma and all beings, sought consent from His Holiness the 14th Dalai Lama and enthroned his nephew as the Shamarpa, taking him under his wing for the guidance of his body, speech and mind. However, as the folk saying goes, one may have enough merit to have a cow but not enough to get its milk. Similarly, after the Parinirvana of the 16th Gyalwang Karmapa, because his followers had unstable samaya, there occurred a schism within this Practice lineage that would have been inconceivable even in a dream. 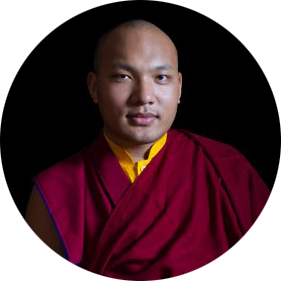 There have been different perceptions of Shamar Rinpoche’s actions both favourable and unfavourable, but the situations of the past, like ripples in water, are endless. These unfortunate situations are, I think, simply due to us not being aware of the omnipresence of our root guru and not being able to generate farsightedness for the benefit of Buddhadharma and all sentient beings. From the time I was young I have had an unmistakable faith and respect towards Rinpoche. Therefore, with the hope of benefiting the Buddhadharma in general and the lineage in particular, and with the expectation that I may be able to offer some service towards his Dharma activities, I had the good fortune of meeting Rinpoche once. Yet, as my aspirations have not been fulfilled, his sudden passing away is a matter of great sadness. As soon as I came to know of this news that is so difficult to believe, I instructed Rumtek Monastery, the main seat of our lineage, and other monasteries in Tibet and other lands to make offerings and perform pujas as grand as possible for 49 days as Rinpoche has taken rest for a while from the degenerate age of strife into the expanse of peace. I have great hope and strong aspirations that Shamar Rinpoche’s reincarnation will embody the examples of his predecessors, and the good fortune of harmony within the lineage will arise soon.